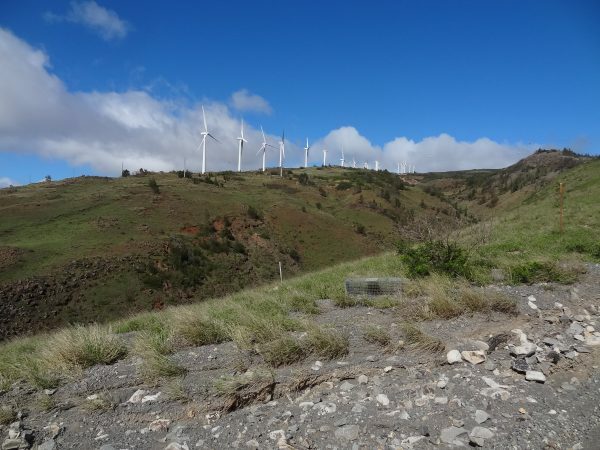 The Department of Land and Natural Resources (DLNR) Division of Forestry and Wildlife (DOFAW), State of Hawaiʻi, pursuant to Chapter 195D, Hawaiʻi Revised Statutes, will hold a public hearing to receive testimony on the Kaheawa Wind Power II Draft Habitat Conservation Plan (HCP) Amendment. Based on monitoring data obtained since the start of operations, the incidental take of the Hawaiian Hoary Bat and Nēnē is projected to exceed the currently permitted levels which requires an HCP Amendment increasing permitted take and adding additional mitigation. The public is encouraged to comment on the draft HCP. If you desire to attend the hearing and require auxiliary aids (taped materials or sign language interpreter) please contact the Division of Forestry and Wildlife, 1151 Punchbowl Street, Room 325, Honolulu, HI 96813; (808) 587-0166. If you are unable to attend the hearing and wish to provide testimony, please send comments to the above address, attention Glenn Metzler or send to glenn.m.metzler@hawaii.gov. Comments should be received by December 7, 2017.